The enlargement was not only one of the most successful policy areas of the EU but has always been a question of “ideology” too. Where should it be heading next? European integration was not only a goal in itself: EU Member States were always keen on expanding the “European neighbourhood” and, as a consequence, making Europe stronger. Unfortunately, the so-called enlargement fatigue has kicked in: following the big boom in the middle of the 2000s, new objectives were to be set, which were not as self-evident and smooth as the ones before. Turkey, the war-torn Balkans and the once bankrupt Iceland are not easy targets of integration in the club, especially when this club itself has been losing its attraction and struggles with a range of internal problems. The tensions are not easing, new issues arise on a monthly or even daily basis. To begin with a positive development, Turkey, whose accession talks were blocked for more than three years now, seems to have gained a new impetus in the process when France recently declared its support to restart negotiations (with Chapter 22). Iceland advances slowly but surely towards accession: though talks are undergoing, its enthusiasm is not remarkable. Most of the Icelandic people are hesitant about their country joining the EU, and following the elections at the end of April, it is likely that the political leadership would not push for a quicker process either. …and what about the Balkans? As for the Balkans, while Montenegro is the quite “good student” at the moment (negotiations started in the middle of 2012), others in the region are causing a lot of headache to EU officials and diplomats. Albania is facing new elections this summer and following the ever-problematic internal affairs, it is not expected that much of the required measures – especially concerning the democratic, fair and frank communication among officials would happen anytime soon. Bosnia and Herzegovina still struggles to make the federal state function, while Kosovo and Serbia are in the middle of a “dynamic” period concerning their relations with each other. With the help (and push!) of High Representative Catherine Ashton, discussions are regular and cover more and more fields – including the sensitive ones such as public procurement, corruption, independent judiciary and others. Despite the serious problems, there is a view that the two are slowly getting closer. As Serbia wants to start accession talks, it would need to ease on its resistance towards Kosovo. Moreover, Catherine Ashton will end her mandate as High Representative in 2014. It would be very important for her to leave an achievement so considerable as easing the Serbian-Kosovo relations. Lastly, Macedonia: the country’s internal dialogue is in its wrecks. At the end of the last year, the opposition basically stopped its parliamentary work following the dubious intervention of government representatives during the budget discussions. EU Enlargement Commissioner Stefan Füle recently cancelled his scheduled visit to Skopje, passing the clear message that under the present circumstances, he would not be willing to talk about the special arrangements between Macedonia and the EU. 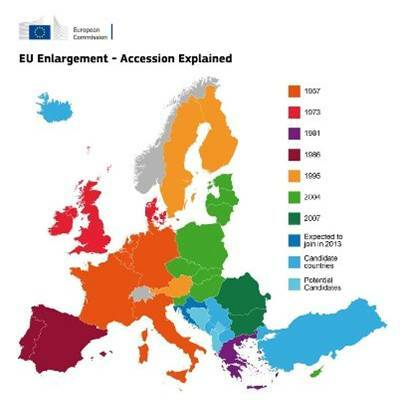 All in all, EU enlargement is not in a good shape, nor is it in an easy situation. Yet, as many argue, challenges can bring about big achievements and this might indeed be true for the current situation in the Balkans, Turkey and Iceland. Hopefully, the accession of Croatia will send a clear message to all the above countries: with hard work and (long) negotiations, you can achieve your goal. No matter what condition the EU is considered to be in, it is – and will hopefully continue to be – still better to belong to the club than to tumble outside in the rough waters. That is where we are: few months before the latest enlargement when Croatia is to become the 28th Member State of the European Union on 1 July 2013.